Dwell by Cheryl: "Decor Tips for an Apartment Bathroom"
I received an email from a reader inquiring about a feature on a Tell Dwell Tuesday post. Her dilemma? The bathroom in her rental. 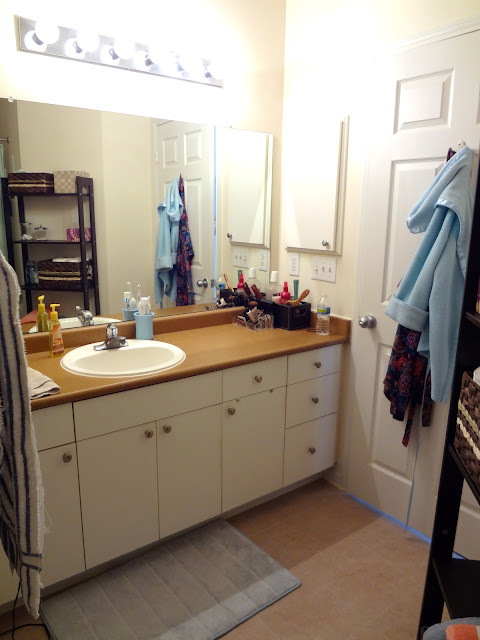 Looking for a way to freshen up the space on a budget, she forwarded over these photos of the existing space. Knowing that she is looking to achieve a cool and coastal look for the space, I selected this bath as the inspiration. 1. 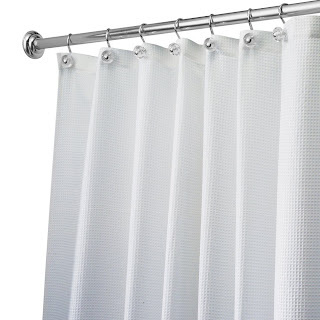 Replace the existing shower curtain with fresh new option. I think she's on the right track with the waffle weave curtain, but the color of the existing one is not quite right. I'd go for a fresh white in a longer length. Take advantage of the height and make the space look larger by drawing the eye upward. 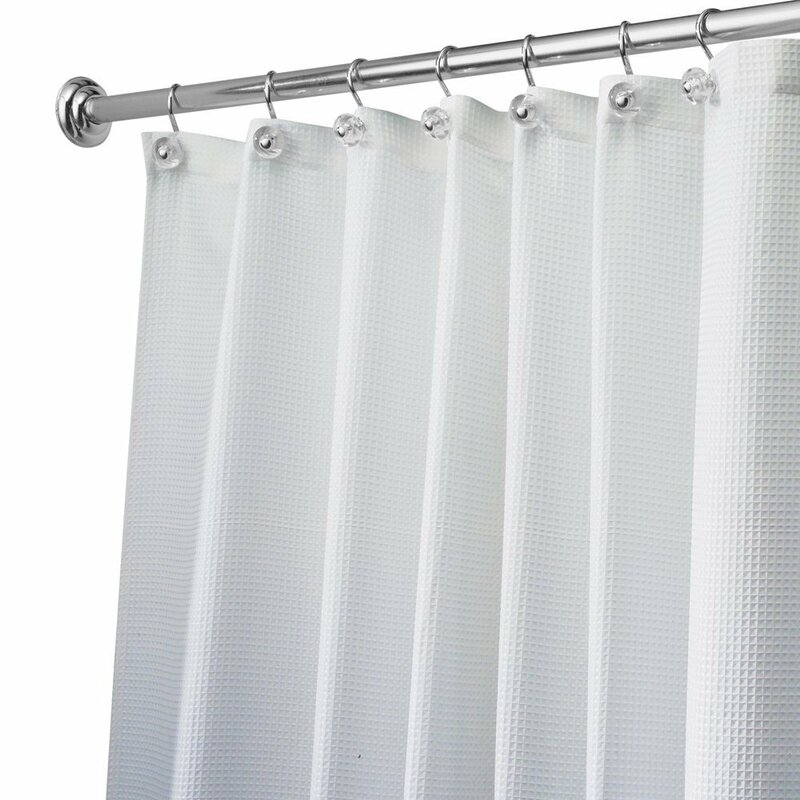 Most people are unaware that shower curtains (off the rack) come in a variety of sizes. This option is available on Amazon for less than $20 in several lengths and widths. 2. Add monogrammed towels (for display). 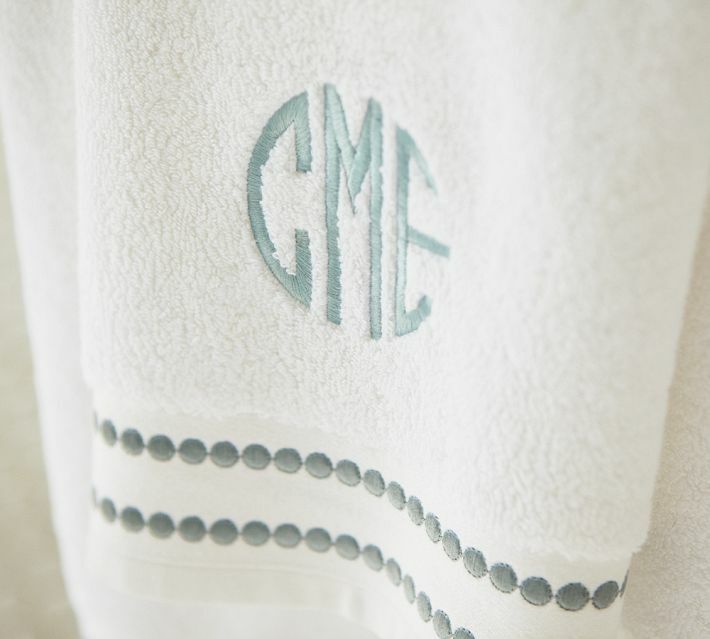 Nothing says fresh (and Southern) like a monogrammed towel. If the look is too formal for you, try fun embroidered sayings instead of the traditional monogram. For example, "Wet" and "Dry" work well in a bath. 4. Pretty up the necessities. Face it, the bathroom is a utilitarian space, but that doesn't mean you have to skimp on pretty. 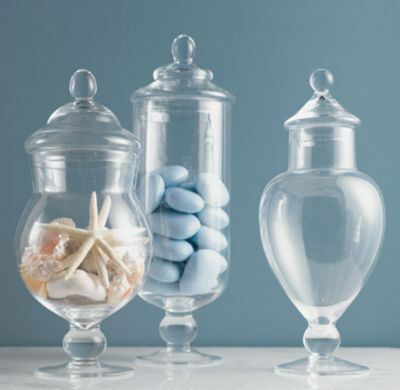 I love storing bath salts, cotton balls and Q-tips in lovely apothecary jars. 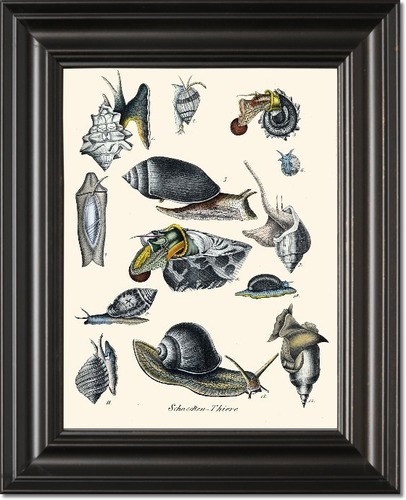 They add instant sophistication to everyday items. 5. 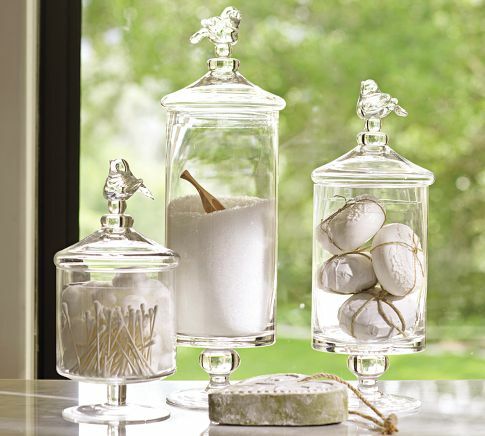 Storage is a must in a bathroom, but keep it stylish. 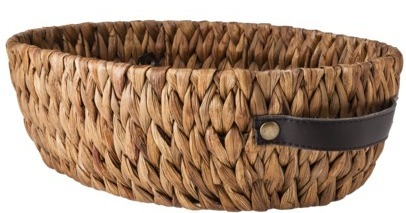 Seagrass baskets would work perfectly with the beach theme without being too themed. Target's Nate Berkus line has the BEST options. 6. Add a spa vibe. 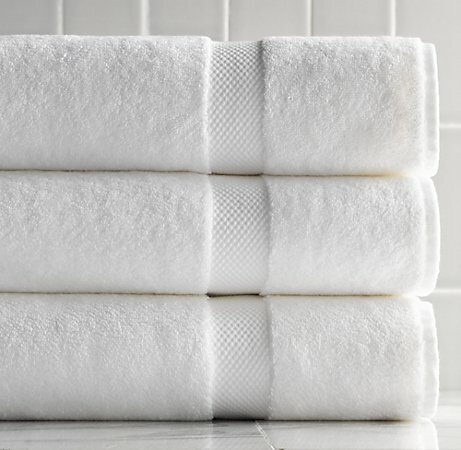 The easiest way to accomplish this is with fresh white towels. I'm a BIG fan of white towels. First, they are bleachable, which ensures that they stay fresh and white. Secondly, they add a plush and luxurious look to a bath instantly. 7. Infuse natural elements. 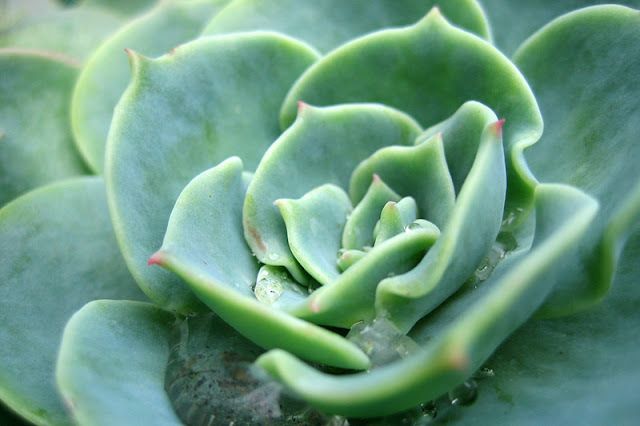 Sand and shells from your summer beach trip, beautiful succulents (that are easy to care for) give the space a more personal touch and add life. 8. 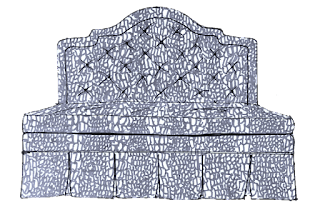 Ground the space with texture. 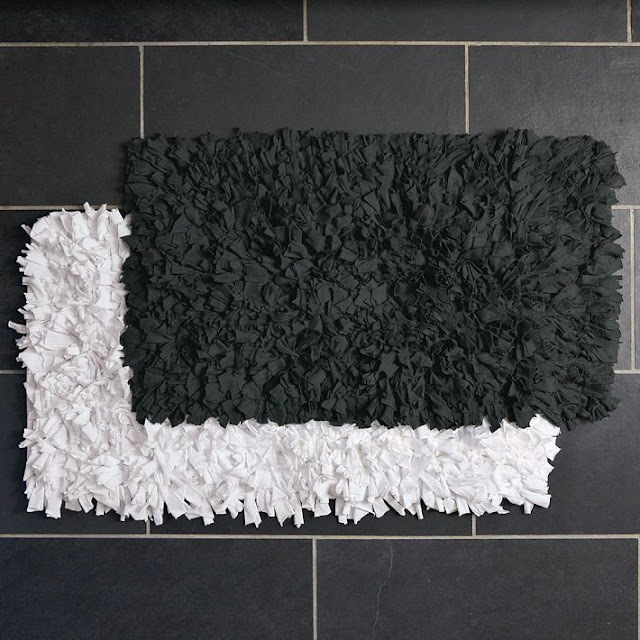 I love a fluffy bath mat (but NOT in front of the commode). This West Elm option in white would work beautifully. 9. Add color. She may not want to hear this, but I recommend painting. Even in a rental. 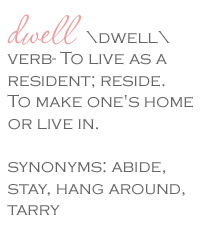 The fact is, if you have to live (dwell) in the space where you are, it should be just what you want. I don't think it matters whether you'll be there for 12 months or 12 years. It's home and it should feel like it. Paint is the easiest (least expensive) way to add color to a space. It instantly completely changes things. A cool blue/green would work wonders in this bathroom. Plus, a room like the bath is easy enough to repaint when you leave. 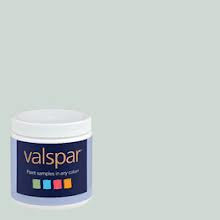 If you don't paint, you'll spend the entire time that you live there trying to compensate for the lack of color that one can of paint could've provided. I like that infuse natural elements idea, it can enhance attractiveness of the bathroom. Thanks! 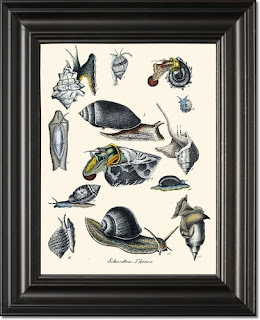 I have some clients who have been asking about ideas for sea-themed rooms and I'll definitely be showing them this page. As an estate agent, it really pays off to have a bit of general knowledge somewhere doesn't it? Haha!